The Freestanding A4,A3,A2,A1,A0 visage menu case is available in a range of finishes. 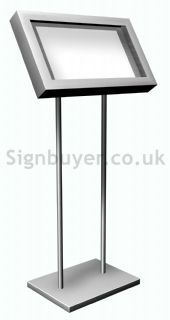 The visage menu case is LED illuminated, non illuminated versions available. The display area comfortably houses an A4,A3,A2,A1,A0 size menu depending on size chosen. 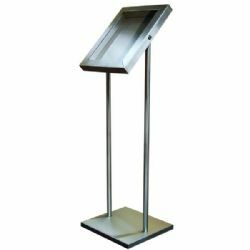 The case can be mounted in either a landscape or portrait format on the pedestal stand. Easy access is gained via a hinged, barrel-locked, frame. 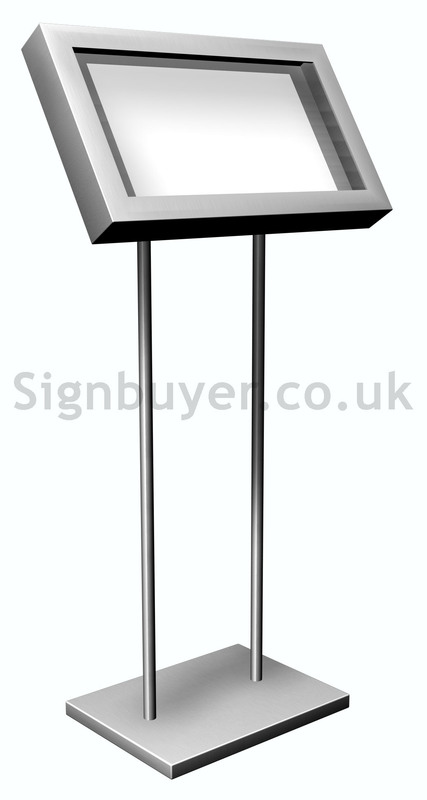 As expected of all Signbuyers products, the Lecturn visage A4,A3,A2,A1,A0 menu case is strong, durable, very competitively priced and, made to order within 10 to 14 working days (depending on available stock). External or internal use. Brass - stand in black, Brushed/Polished Stainless Steel - stand in stainless steel, Black - stand in black, Silver - stand in silver, Bronze - stand in Black, Copper - stand in Black.